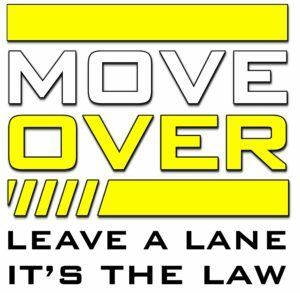 Slow Down Move Over – In British Columbia, motorists are required to slow down and move over for all vehicles stopped alongside the road that have flashing red, blue or yellow lights. This includes maintenance workers, utility workers, police, fire, ambulance, tow trucks, Commercial Vehicle Safety Enforcement personnel, land surveyors, animal control workers, garbage collectors and other roadside workers. If travelling on a multi-lane road, drivers must move into another lane to pass when passing stopped vehicles with a flashing light, where safe to do so. This provides roadside workers and emergency personnel with greater protection from accident and injury. Drivers failing to adjust their speed or failing to move over may receive a $173 traffic violation ticket that also carries 3 penalty points. Offences and infractions that include penalty points can lead to a driving prohibition. The Commission developed TV ads & rack cards to help educate motorist about this very important piece of legislations and to support the emergency responders and road workers who risk their lives working out on the roads. Distracted driving is a leading cause of car crash fatalities in B.C. and one of the most common distractions behind the wheel is a mobile electronic device. Most of us know not to text or check emails while driving, but programming a GPS, changing a song, or even playing a game can be just as dangerous – and just as illegal. Not only is using an electronic device while driving a bad idea, it’s against the law and can result in significant penalties and fines. In fact, your first distracted driving ticket will cost you $368 and add four penalty points to your record. In addition, distracted driving has been designated a high-risk driving infraction, which means that those drivers who incur two or more infractions within 12 months will be considered high risk and their driving records will be reviewed by RoadSafetyBC, potentially resulting in a 3-12 month prohibition. Graduated Licensing Program (GLP) drivers who incur one distracted driving infraction will also be considered high-risk, and will be reviewed by RoadSafetyBC, potentially receiving a 1-6 month prohibition. GLP drivers may be subject to longer prohibitions for subsequent infractions. When you’re driving, leave your phone alone. The Commission has supported the Provincial Enforcement Distracted Driving Campaigns by developing a humours educational video through their partnership with CTV. The majority of rear end crashes are a result of distracted driving – the CRD Traffic Safety Commission partnered with ICBC Road Safety to reduce the risk of injury in a rear end crash through community events, highway and vehicle signage and a TV commercial in partnership with CTV. Over the last 10 years in the Capital Region, almost 60 people have died as a result of impaired driving. That’s in addition to the 3,400 crashes and 1,900 injured victims from crashes where alcohol- or drug-impairment played a role. While the situation is improving, drinking and driving is still injuring too many people in our region. The penalties for getting caught are significant – thousands of dollars in fines and penalties, vehicle impoundment, licence suspension and having to participate in one or more remedial programs – but clearly, more must be done to further eliminate this kind of behaviour. Being impaired by drugs and driving is a growing concern as well. With marijuana legalization expected in the near future, and a general lack of awareness of the dangers of driving while impaired by medication, it’s likely that targeting drug-impaired driving will need to be a focus of the CRD Traffic Safety Committee now and over the coming years. The Commission developed an educational campaign to support the local police with their provincial CounterAttack Campaign, this was achieved through strategic radio ads, that ran during the campaign and in some cases carried on right through to major sporting events. They also utilized their CTV partnership to extend their safe ride home message with TV commercials with actual CRD based police officer. Speed is too often a contributing factor in many vehicle crashes causing injury and death on our roadways. Police continue to issue violations for speed infractions on a regular basis throughout the CRD. 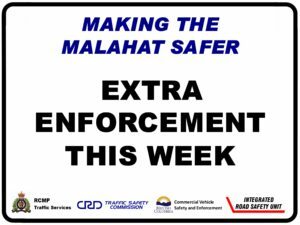 In May 2016, officers of CRD’s Integrated Road Safety Unit conducted a targeted enforcement strategy for the Malahat. Officers issued a significant number of violations for speeding, impounded vehicles for excessive speeding, and conducted several impaired driving investigations as a result of stopping speeding drivers. Drivers need to turn their minds towards safety first and change their driving behavior. High-risk driving behaviours, like excessive speeding and failing to yield, increase our chances of being in a crash. According to police statistics, high-risk driving behaviours contribute to nearly half (43 per cent) of all crashes that result in injuries or deaths in B.C. High-risk driving includes the following behaviours: speeding, failing to yield, ignoring traffic control devices, following too closely and improper passing. We strongly encourage anyone starting out on a motorcycle to enroll in an ICBC ‘certified’ training school before attempting to ride on the street. Education is the best investment to safely enjoy your new bike. Safe riding skills and safe gear are key factors with motorcycle riding. 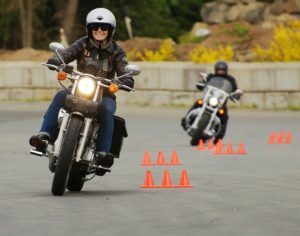 Self-taught riders would also enjoy and benefit from an experienced riders course. Regular refresher courses also ensure that riders keep their skills current, and learn how to react properly in case of an emergency. Trained motorcycle riders will become safer vehicle drivers. Cyclists, like pedestrians, are vulnerable to significant injuries or death in car crashes. The top two contributing factors police attribute to drivers in car crashes involving cyclists are distracted driving and failing to yield the right-of-way. The Commission has partnered with the CRD on a multi-approach project that promotes safe cycling & pedestrian education. The CRD People Power program is made up of 18 complementary projects which motivate and support residents to safely walk, cycle, roll and use public transit more often. The two-year pilot project uses a collective impact model to harness the skills and knowledge of partner organizations and encourage the use of active transportation for commuting and recreation. A key People Power program is the Active and Safe Routes to School project. The CRD is working with over 25 schools across the region to encourage and support students and their families to walk, bike, bus or roll their way to school. The Active and Safe Routes to School initiative brings together municipal transportation planners and engineers, school districts, public health and local law enforcement agencies to identify infrastructure, education, and enforcement needs on the school ground and in the surrounding neighbourhood. The program includes collecting detailed travel data and identifying infrastructure gaps before drafting and implementing a School Travel Plan. The Traffic Safety Commission generously contributed funding towards the People Power program. 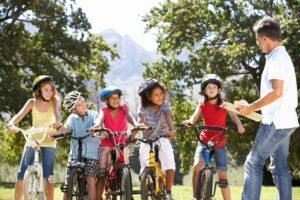 This funding enabled the expansion of the Active and Safe Routes to School program to include additional schools and activities, including providing bike safety skills courses. As well, with financial support of the Traffic Safety Commission, the ‘Helmet and Lights’ campaign was developed to provide free bicycle helmets and lights to targeted demographics to improve access to cycling and promote safe behavior while riding. The Commission also has done a number of safety initiatives over the years to promote the use of highly reflective clothing & that it is essential to make eye contact when crossing the road. Every year in BC, an average of 1,400 children under age nine are injured and four are killed in motor vehicle crashes. Research shows that seat belts and child car seats – when used correctly – are the most effective tools in preventing injuries and deaths in car crashes. BC law states that the driver must ensure all children in the vehicle under 16 years old are in appropriate and correctly secured in a child car seat or seat belt. As children grow and change, the type of protection system needed also changes. The Commission has partnered for a number of years with Beacon Community Services to assist them with providing information to communities and families throughout the CRD. We review traffic safety problems in the CRD and make recommendations to the CRD Board, through a CRD Board Committee, for the purpose of reducing or eliminating the problems, and plan and operate Traffic Safety education programs within the CRD.